Because Modern Fantasy fiction comes in so many flavors, it’s virtually impossible to come up with a definitive recipe for writing The Perfect Fantasy Novel. What I propose to do, in this and subsequent posts, is to examine technical strategies for producing a good fantasy novel regardless of sub-genre. One of the first distinguishing features of a fantasy novel is that it takes place in a setting defined by the imagination of the author. Where (as in Tolkien’s Lord of the Rings) the setting is completely detached from the mundane world as we know it, the author must reckon with the sub-creative process known in the trade as world-building. World-building entails “realizing” your fantasy world by endowing it with features analogous to the world we know. These features include geography, history, languages, culture, and technology. As a general rule, the more “concrete” your fantasy world in terms of these attributes, the more convincing the setting becomes to your readers. 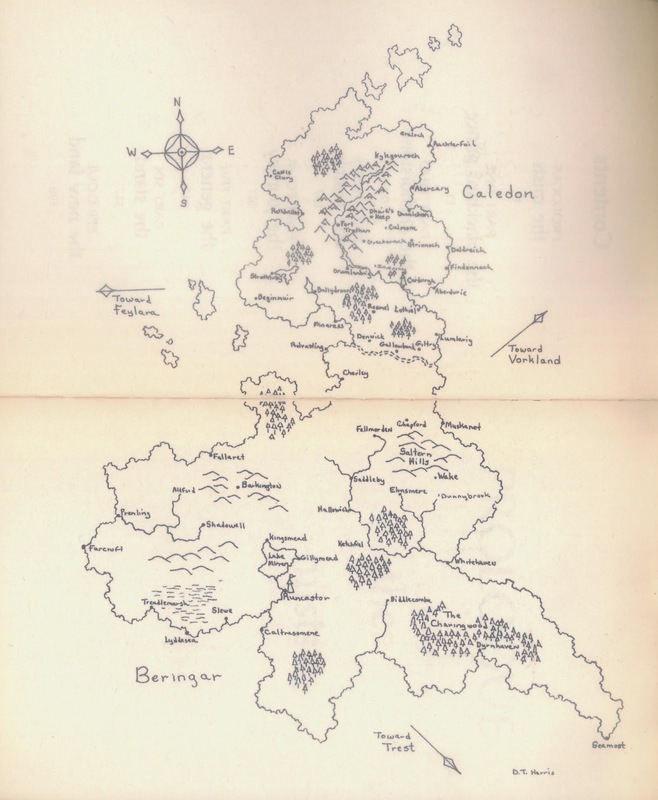 As demonstrated by Tolkien, one way to “realize” the geography of your fantasy world is by mapping it out. (I fondly remember poring over the fold-out maps of Middle Earth in the hardback editions.) 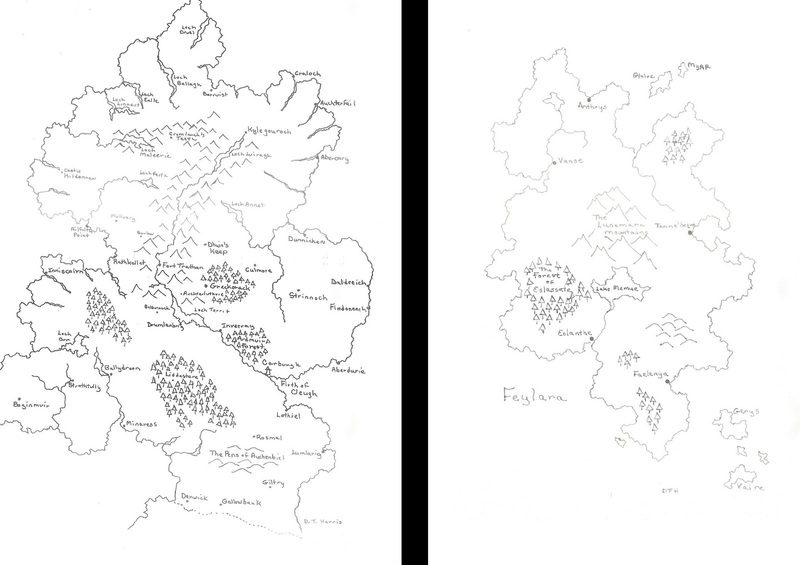 Map-making has always been a feature of my own creative process – partly just because I enjoy it, but also because it lends solidarity to the fantasy world I’m trying to create. 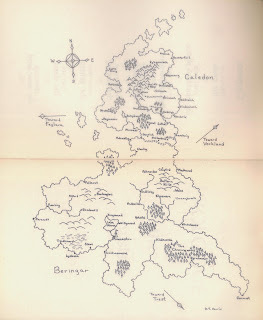 While I wouldn’t necessarily insist that every fantasy writer should map his/her world, I would certainly recommend it – especially if the plot calls for large scale action, like a war between rival powers. Even if your plot doesn’t involve armies on the march, a map is a handy device because it enables both you and your readers to keep track of the action. You don’t have to be an artist: even a rough sketch showing compass orientation and relative distance in travel time between various locations can make a world of difference when it comes to plotting out character movements. Q: What’s the source of this rivalry? A: Aristocrat A’s wife ran off with Aristocrat B's. Q: Why did she run off? A: Because she’d been married against her will in the first place to cement an alliance between Aristocrat B and her family who come from the neighboring mainland. Q. Why did the family want this alliance? A: Because Aristocrats A and B are both corsairs, and her family was sick of getting plundered. Etc., etc. This kind of thinking sharpens your sense of how your world works and how your characters think. Working out these mechanics can help eliminate continuity problems at the source. But of course, geography and history aren’t everything. In our next installment, we’ll be considering culture, technology, and nomenclature. I prefer not to look at the maps while I'm reading a fantasy book, (until after I'm finished the book). I have found far too often that if I turn to the map, it is inevitably different to the directions I had envisaged and then I have ended up flipping back and forth between the pages I'm reading and the map(s) and getting distracted and it pulls me out the story. I now prefer to let it unfold in my imagination even if I'm wrong. Timely advice. I'm struggling with world building at the moment with a new story set in what was Geneva, Switzerland. 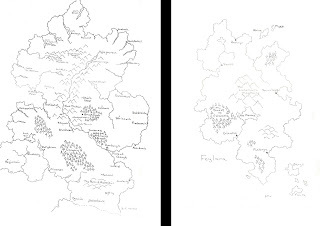 I also used an actual map when writing my fantasy series. Even if not writing a different world, I think it helps to layout a house or other setting location to get a visual on the place being used. I like to gather photos of rooms, etc. to help me come up with descriptions. I do agree with Elle that if I have to consult a map (or lineage tree, or side notes)it mars my enjoyment of the book. I think it makes a fun extra for the book and the website for a book (for people who enjoy maps and extras). I recently posted my own musings about creating a fantasy world. Wish I had this article two years ago! I'm with you, Elle, I have never referred to maps in any book, fantasy or historical, as I read. But they are interesting after I'm finished with the story. While most mystery writers do not draw intricate maps of their setting, I do block some scenes on paper. Maybe that is natural for me because I do so much blocking in theatre. But it does help choreograph scenes where there are a lot of people and action happening in different places in a room, such as the climactic scene in One Small Victory. Like Diana, I need to have a visual for where I am going to set a scene, and I used to always scout locations to pick out houses or other buildings. Here's a timely look at some awe-inspiring world-building. Seems I'm the odd editor out here because I do look at maps. For me, they ground the location and the action, which helps me to visualize the story as the writer intended. Otherwise, I've found that the map created in my mind as I read sooner or later lends to confusion because what's happening won't work with the map in my head. This is great grist for the fantasy mill, Debby, and it transfers well to other genres. Readers need a point of reference, a location in which to place the story and its characters. While that location may occasionally be only in the mind of the protagonist, it more likely will include a physical place for the action. Nice . . . very nice. This is such a practical (aka useful) post. I'm looking forward to the next ones. Well, Debby, you just outlined several of the reasons why I do not delve into the fantasy genre: geography, history, languages, culture, technology ... good grief ... I had to take a nap after just reading this post! How to make clickable links in comments. We'll see if I have it memorized yet. Like Linda, I see these techniques as transferrable to any fiction genre. I write women's fiction and have used maps (for myself, but still) and sought out relevant history (a must!). World building is the responsibility of all authors. Just because a city is real does not mean it offers a fertile setting for a story—it's the job of the author to carve out the relevant details. World building can be a lot of work, even in a book which is not a fantasy. Decisions need to be made whether or not to use actual places, virtual places, or a combination. I used a combination in my books, because I didn't want people to complain if I made an inaccurate or unappealing description of their street or a place they visited. Very interesting. I don't write fantasy, but I set my mystery series in a made-up town, so I have to map the town out.